I love this quote – for me it is a representation of all things lost when we avoid taking risks, great or small. I can’t say it has been comfortable, but I am not opposed to the idea of taking risks. I took a risk 13 years ago when I bought an old 1912 uninhabitable Victorian house. It was one of the greatest projects of my life, created with my own hands alongside those of family and friends. I didn’t know at the time, but the process of bringing that house back to life was a direct metaphor of bringing my own self back to life. Within 2 years, I resigned from my job, sold that lovely house, and packed up whatever belongings I had left after a major yard sale purge. I was ready to take my next risk, a 12-month (or so) period of travel in Europe and across the United States. So, off I flew to Europe. I could not begin to understand that one of my life’s biggest risks was yet to come. Not even 2 months into my travels, I met a man at the train station in Gothenburg, Sweden, when I asked if he spoke English and could help me find my lost CD player. He said ‘yes’, and 2 months later I said ‘yes’. That man is now my husband, and that 12-month travel plan never happened, and I never returned to the U.S. to unpack all of those belongings I had left behind. That was 10 years ago! Yes, I’ve taken some risks. We bought a house nearly 3 years ago, one that requires total renovation in order to properly give it a new life. It’s a much slower process for me this time – but none the less satisfying. 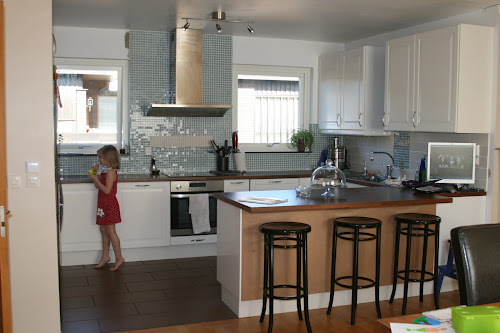 We’ve tackled the kitchen first, and it wasn’t until we took the risk of finishing some of the work ourselves that we really got a kitchen that includes a real piece of us – regardless of what current trends of Sweden dictate. Let me explain. But first, a peek at the (almost) finished product. 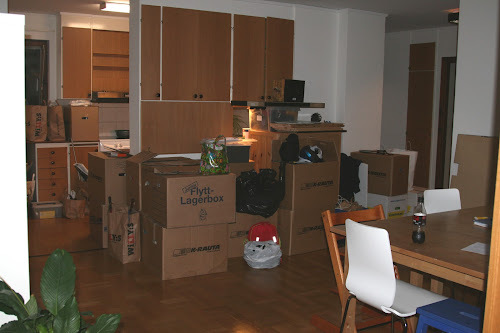 We felt overwhelmed, so we originally hired out the work, but that money quickly disappeared as everything seems to cost 3 times more here in Sweden than what I think it should. So, we TOOK A RISK and decided to finish the work ourselves (hanging cabinets, tiling walls, installing appliances, etc.). 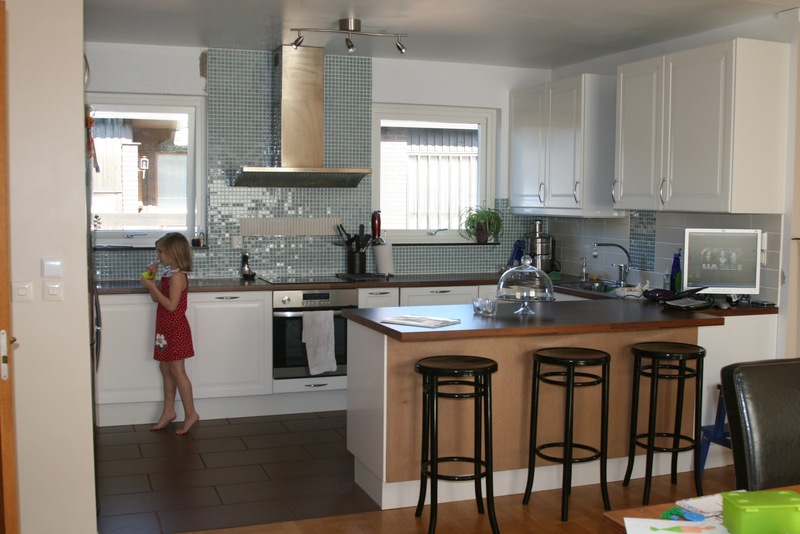 We wanted a clean-style kitchen to match the 70’s flat-roof architecture of the house itself. But at some point I felt it was getting ‘too clean’ – that’s when I took another risk and grabbed some long stone tiles that I had saved from a trash pile at a local tile store and slapped them right in the middle of the clean-lined glass mosaics that I had been using. It wasn’t until I added this little piece of ‘junk’ to our kitchen that I felt it was more complete, more mine. The wall below this area was not totally smooth and the rest of my tile turned out a little jiggly – something my husband said added more character (bless him). The glass mosaic tile wall may not be perfect…but it IS perfectly me! Those belongings I left back in the States were whittled down over the years and dispersed to my American family – all but the most near and dear items and artwork that represented my ‘historical me’ – which have finally been reunited with me here in Sweden. Thus, the reason for starting this blog and naming it after my precious-but-less-than-perfect blue velvet chair. As cheesy as it sounds, my past has now joined my present and I feel more whole as I move into the future.A big thanks to Nesting Place for your National (not really) Take a Risk Day. Love it! I have the same tile backsplash. Love that you took it all the way up the wall! alright, I know I've already seen this, but you are pinning all ur great projects and I'm having to look again and I didn't mention before but besides the kitchen..I love the LOVE story! Looking at your kitchen renovation. It is so great. I cannot wait to get my hands on a project of my own. I am going through all of your posts right now. gorgeous kitchen! I want to go to Europe someday! I already have the man part lol. Love how your kitchen turned out! Beautiful! Carly – born in California, raised in Kansas, and lived 6 years in Arizona as a working adult. And then there was the big jump across the pond to Sweden! Meeting my husband was being in the right place at right time, and being open to the whole encounter. It's a fun story…so I'll have to post sometime about it. whoa! that's an incredible transformation! love it! 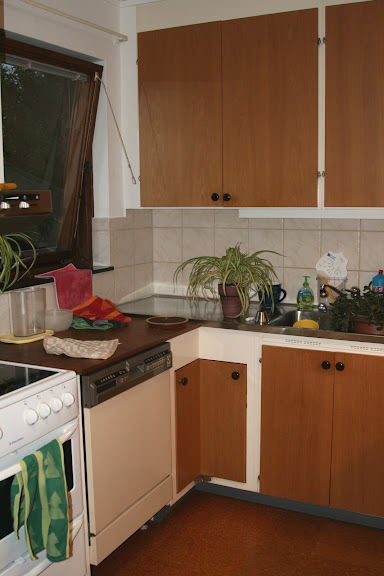 Your kitchen looks so bright and pretty now! I love the backsplash and the white cabinets!